A Wal-Mart Supercenter in Black River Falls, Wisconsin is installing hitching posts for the Amish so they can hitch their buggies to something other than the store’s signposts, trees, or whatever else is available. The store wants to make it easier for both the Amish to park there without asking the important question of “Where am I going to hitch up this buggy?” and also for the rest of the store’s patrons and employees who desire a bit of order in the world. This isn’t a new idea, either. Wal-Mart and other stores have been doing this for years in Pennsylvania, Ohio, and Indiana, all states which contain a sizeable Amish population. However, it is new to Wisconsin, which contains about 10,000 Amish residents. However, a professor at UW-Eau Claire stated there are only about 150 Amish around Black River Falls. More Amish live in Tomah and Sparta, which are near to Black River Falls and also have Wal-Marts, but without the coveted buggy hitching posts. Guess we know where they’ll be going from now on. Has anyone else seen anything like this before? I know I’ve seen Amish buggies pulling in to a Walgreens in Indiana and also shopping at the Cross County Mall in Mattoon, Ill., but do they regularly shop at the same stores the rest of the population frequents? I’m admittedly pretty ignorant about their culture, and also curious. At any rate, it’s considerate that the stores are accomodating to such a small fraction of the population. Anything for a buck, I guess. 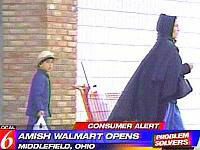 It doesn’t answer the biggest question, though: what are the Amish doing shopping at Wal-Mart? I thought they shunned the conveniences of modern life (electricity, etc.) Isn’t shopping at Wal-Mart cheating a bit? Like you, I really don’t know a ton about the Amish. Of course, I don’t think they’re big on the internet either. There are a few Mennonite sects that still use horse and buggy but aren’t as strict as the amish that would serve as a group that Wal-Mart might draw. Still, you have to go somewhere to get tools, or sewing supplies, or nails, so why not Wal-Mart, especially in these towns where Wally World is one of the few options left. On another note, at least the developers of the two Wal-Mart’s that I’m dealing with won’t need to worry about my office requesting this provision on-site. Either go to Wal-Mart or stock the buggy up for two weeks worth to cross the river for Target. There are several Amish around northeastern lower peninsula of Michigan. I once saw a horse and buggy parked at the Save-a-Lot in Gladwin. In the small town I am in, Bowling Green, MO, there is a sizable Amish population nearby. I often see the Amish folks shopping at Dollar General, IGA, Orscheln (Farm Supplies), and the local hardware stores. I always find it interesting to see whats in their carts – surprising to see things like prepackaged foods. It isn’t abnormal to see them eating at the local fast food establishments, banks, or doctor’s offices either. There has been talk of a Supercenter in Bowling Green, and I would have to imagine if it ever gets built, it will have hitching posts, and will carry items specifically for the Amish. I find it amusing that Wal-Mart will try to appeal to a small minority when they purposely ignore larger minorities. What is their logic? Oh wait, perhaps notoriety? They were on the evening news. Ah, warm fuzzy Wal-Mart. There are several varieties of Amish and Mennonites, varying in the strictness of their beliefs. However, I don’t think any of them are constricted from shopping at Wal-Mart or any other store as part of those beliefs. I recall shopping at a booth at a farmer’s market in Bird-In-Hand, PA that had two people working the booth – the owner, who was “strict” and another who was not as strict or not Amish at all. If you bought something and were waited on by the owner, she made change from a wooden box and only took cash. The other person was there to work the regular cash register and credit card terminal. My understanding is one of the basic tenets is to be “off the grid” so to speak – some Amish don’t have electricity, but others have electricity as long as it’s provided by their own generator or windmill. And though they may have horses and buggies, there ae a lot of Amish who don’t mind accepting a ride in someone else’s automobile. Wal-Mart is a-ok for most Amish. Fits well as they try to live frugally. 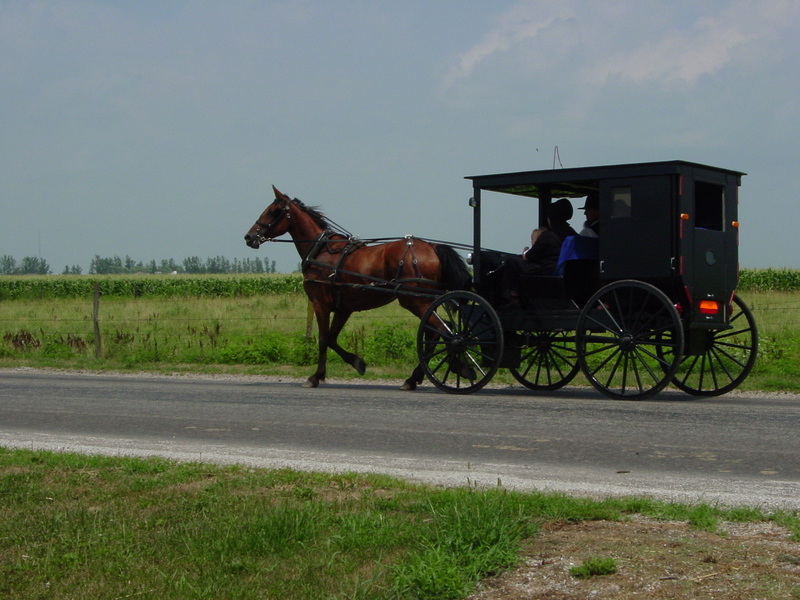 Amish women hire ‘Amish taxis’–big 15-person vans usually–to make Wal-Mart runs on a regular basis. Electricity is not off limits–just depends how you get it–off-grid is right. Gas generators power washing machines and other equipment. Flashlights are often acceptable. 12-volt batteries are used to get juice. Some Amish wood shops are actually on-grid. Even some homes of certain churches allow public power now. PS I’m not Amish or Mennonite, and not trying to be a know-it-all, just spent time with Amish in different communities all across the US. It’s kind of my life now. I’m an Amish junkie I guess. You say they stop to get sewing notions, well not for long. Walmart has discontinued many sewing supplies and will soon stop selling fabric. This means you’ll have to go to the expensive fabric stores.